The Kohl's Black Friday ad was leaked Thursday and revealed some big deals on popular gifts such as TVs, appliances and video games. 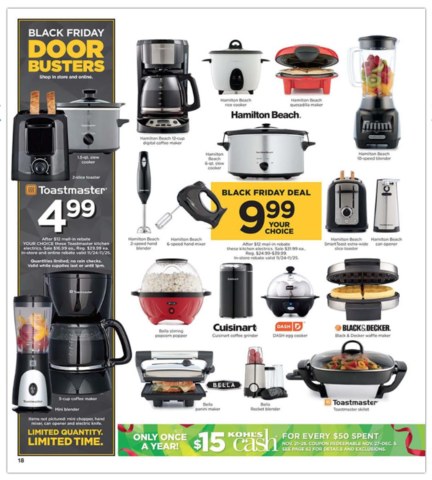 A centerpiece of the Kohl's Black Friday ad, leaked by BFAds.ne t , is a collection of 16 Hamilton Beach kitchen appliances on sale for only $9.99. The collection includes a crockpot, coffee maker, waffle iron, blender, toaster and more. Kohl's Black Friday deals start online Monday, Nov. 21 and its stores will open at 6 p.m. on Thanksgiving. Savings will include Black Friday Doorbusters both online and in store until 1 p.m. (or while supplies last). NOTE: The KitchenAid Classic Stand Mixer (KSM75) will be available for $199.99 with $45 in Kohl's Cash. The KitchenAid Artisan Stand Mixer (KSM150PS) will be $279.99 with $75 in Kohl's Cash. Kohl's also has a Black Friday Preview sale live on their website right now, including buy-one, get-one for $1 health and beauty items.